15 years of experience has culminated in the ultimate FX pump. The FX four-stage pump has a totally unique gearing system you will not find on any other pump. This allows the user to 'change gear' depending on whether they want high volume (with lower pressure) or high pressure (with lower volume). 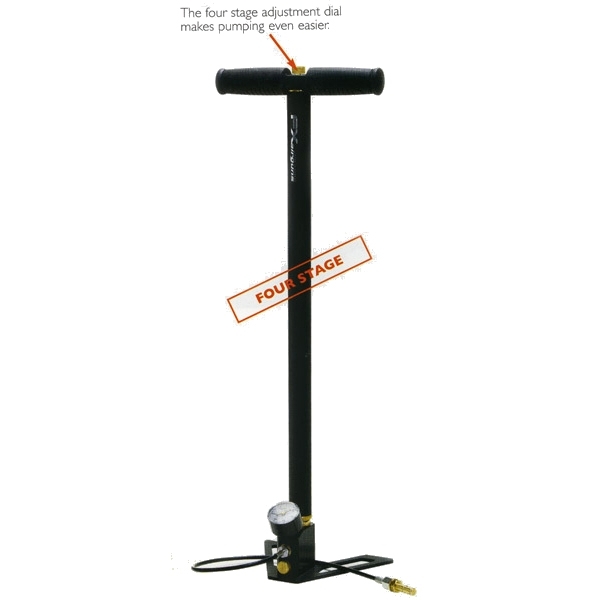 This enables the user to fill the air tube rapidly with over 300cc of air per stroke and then change down gear (less than 200cc per stroke) to reach recommended fill pressure with ease. Contains an in-built moisture trap which means you do not have the inconvenience or expense of changing additional 'dry packs'. The pumps mechanism has been endurance tested by machine so you can be sure of many years trouble free usage. Fast delivery and quality! Recommended! Well built very easy too use I am out of shape I smoke too much using this pump is a doddle. as they saydose what it says on the tingood . The instructions that are supplied are terrible - as bad as something from Ikea. Luckily, there isn't much to actually put together - just make sure you put a washer between each part that is screwed together! Pumping to 150 bar is really easy. It only gets a bit hard from 150 to 220 bar. However, it doesn't take long so very happy and no need for a tank! Don't buy a dive bottle, buy this. So easy to use with no sweat or undue pressure on your body, I am 61 yrs 11 stone ringing wet, this pump is to easy to use, gonna sell my dive bottle. First delivery had screws missing, some signs of use &amp; had 3 old spanners with it. This exchanged. Very easy to pump up my HW100KT. Manual is poor &amp; after email to ASI/importers, reply was: "The small black plastic spacer sits inside the base of the pump behind the external moisture trap(large brass part) when this is screwed in.&nbsp;The particle filter sits inside the small brass part (particle filter housing) when screwed to a filling adaptor." I was recommended the fx stage four pump as an alternative to a it cylinder for my s410f air arms &amp; I have to say it's great easy to store &amp; does the job well. It's great value &amp; I would recommend it as a must have piece of kit for all pcp rifles gives you a little workout too not a bad thing. Recently purchased a PCP. Was it to be bottle or pump?&nbsp;I am 73 years old, 11 stone and 5 feet 10 inches tall and only average fitness.&nbsp;Anyway I purchased a four stage FX4 pump. MyPCP fill range is 90 to 200 bar. A 75 pump combination of stage 3 &amp; 4 pumps achieves this range of fill in less than 4 minutesl with comparative ease. Do not believe all the agony stories. I get more out of breath climbing two flights of stairs than using this pump. It really is a superb piece of kit. Purchased this pump as a back up for my dive cylinder, very impressed with the build quality and ease of use. More impressed with the 5 year warranty. Highly recommend. I've had this pump 3 weeks now and impressed would be vastly understated. It's so easy to use and set up from the box. It charges s my HW100KT in about a minute or so(yes that's correct). I've a problem with my arms and this was recommended by a disabled shooter as the 4 stage gearing so to speak is fantastic. You will not be disappointed with this as there's no yearly check or lumpy buddy bottles to hump around. i got this pump for my s200 air arms was not sure if it would be any good. after hearing storys like 85 pumps to fill .iam very pleased with pump takes no time at all to fill 190 bar will not be rushing out to get dive bottel.came very well packed if you got low bar gun get one. Have just bought my first PCP and decided to get a pump as I live in the country far away from any place to refill an air cylinder. This is a great pump, a couple of minutes work fills my gun completely. It's nothing like as hard as I'd been led to believe - I'm 66 and it is really no problem at all. Apart from the ease of use and effectiveness, the pump is very robust and well made, from a very reputable company. Excellent service from Uttings, too! excellent well pleased ,i was worried at first that it would prove to be to hard to use but hey i'm a ten stone five foot six man aged fiffty one and i found no problems using the pump just as long as you release the pressure as you go. Also would just like to add how helpful the guys at uttings were certainly being buying from them again thanks mick. Had this pump for around a year now, I also live in Wales and got this from Uttings, My closest fill shop is 20Miles away. Recently stripped my rifle for maintanance and to check for any signs of water ingress from use of the FX4 Stage Pump, To my surprise there was no signs of moisture visable anywhere in the reservior. What is important with this pump is that you release the pressure at regular intervals as the Water trap accumalates a high volume of water, I release the air every 50Bar or so of pressure. It is hard work towards the end and the 200cc/300cc gearing system makes pumping alot easier. The extra cost of this pump compared to its cheaper competitors in my opinion is justified due to the lack of a dry pack, and its ability to change the volume of air pressure being pumpud by the turning of a valve screw. Worth every penny. And would reccomend this pump to all. 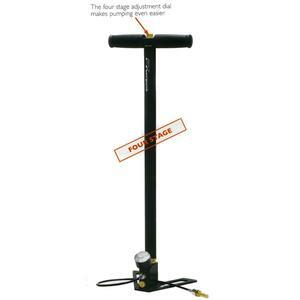 I had FX Four Stage Pump from Uttings i was pleased with product i received it was very simply to put together i had it working in no time and was pumping my Gun up to pressure and i was pleased with the gear system which helped to make easier to bring to pressure. As i am sightly disabled well worth the extra cost.I live in a area in Wales which it is very difficult to fill and test air tanks you have to a long way to do this.